Photograph courtesy Grahame Wareham. A fine sunny August 1971 day at Inverness highlights 5115, truly a Scottish machine complete with headlights, snowploughs, unique boiler room blanking plates, weatherproofed headcode glazing and other Scottish modifications. The sixteen year eight month career of D5115/24115 was spent allocated only to Scottish Region depots. Scottish 'Highland' modifications: twin headlights, tablet catcher, boiler room grille, cantrail water filler sheeted over, winterisation features : gangway door weatherstripping, headcode box weatherproofing. May 1960 to Inverness (60A). April 1961 to Kittybrewster (61A). May 1961 to Inverness (60A). October 22nd 1976 to store (serviceable). October 31st 1976 to store (unserviceable). After withdrawal 24115 was stored at Millerhill from January 1977 to May 4th 1977 when it was moved to Swindon Works and broken up by the second week of June 1977. Movement: 24065, 24107/15/24 02.20 Millerhill - Derby - Gloucester - Swindon, May 4th 1977. (24115 & 24124 were the only two ex-Inverness 'Highland' Class 24s to be scrapped at Swindon). Noted Glasgow Works November 1971. Condition May: green livery with frame level stripe, shortened fuel tank, full size water tank, boiler room grille present, hand/footsteps present, cantrail water filler present, three-rung bogie mounted footsteps, ridge sided sandboxes. On March 10th D5115 was noted stabled at Inverness coupled to a Class 26 with the gangways doors in use between the two locomotives. On June 12th D5115 was noted working the Aberfeldy branch passenger service. Condition June: green livery with frame level stripe, full size water tank, shortened fuel tank, tablet catcher equipped, boiler room grille present, hand/footsteps present, cantrail water filler present, three-rung bogie mounted footsteps, ridge sided sandboxes, three-piece minature snowploughs fitted. Timetable changes beginning in May brought Inverness based Class 24s to the Waverley route, made possible by the alterations to Inverness diagrams following closure of Moray coast lines. One of the diagrams involved the 07.06 ex-Edinburgh, 13.00 ex-Carlisle, 17.54 ex-Edinburgh and the next days 09.20 ex-Carlisle. Most times a single machine sufficed, noted were D5125 (8th), D5122 (9th) & D5115 (10th & 11th). Condition July: blue/yellow livery, gangway doors sheeted over, headlight fitted, shortened fuel water tank, full size water tank, boths tanks fitted with circular gauges, blanking plates fitted (five slats), bodyside valencing removed, hand/footholds plated over, cantrail water filler sheeted over, three-rung bogie mounted footsteps, ridge sided sandboxes, three-piece miniature snowploughs (yellow). During August Inverness Type 2s were frequently diagrammed on freight or parcels services to Berwick & Newcastle, so noted was 5121 on August 7th & 5115 8th. Condition April: blue/yellow livery, gangway doors sheeted over, headlight fitted, shortened fuel water tank, full size water tank, boths tanks fitted with circular gauges, blanking plates fitted (five slats), hand/footholds plated over, cantrail water filler sheeted over, three-rung bogie mounted footsteps, ridge sided sandboxes, three-piece miniature snowploughs (yellow), 'Inverness' inscribed between number and builders plate. On October 10th 5115 was derailed all wheels near the Carlisle Fuel & Inspection depot. The locomotive had been left at the fuelling point, shut down, with handbrakes applied to the No.2 end bogie at 22.00 hours. Within ten minute it had rolled away and derailed by the catch points. The Carlisle breakdown crane hauled by shunter 3169 was utilised to rerail 5115, the locomotive being back on the rails by 06.00 the next morning. January 31st found 26029 on fire whilst hauling the 04.35 Edinburgh – Glasgow, rescue coming in the shape of 24115. 24115 was stabled on Millerhill at lunchtime on May 2nd. 24115 was noted running at Inverness on July 18th. 24115 was noted at Tyne Yard on July 28th with a freight from Millerhill. September saw much activity for the few remaining Class 24s, their demise was imminent since more Class 25s were expected on transfer from the Western Region. Amongst many freight and parcels workings 24113 & 26027 worked the 13.10 Edinburgh – Inverness passenger (11th), 1E83 Edinburgh – Newcastle (?) had 24115 (15th), 24106 (17th), this day also found 24115 & 24120 on 07.40 Aberdeen – Edinburgh, whilst the last day of the month saw 24120 & 24104 on 12.30 Aberdeen – Edinburgh. By October 22nd all the remaining Scottish Region Class 24s were officially stored at several locations, the majority (at least fifteen) at Millerhill, leaving the remaining eleven active members all based at Crewe. However their retirement was not entirely because of their unserviceability. 24121 was revived from store at Polmadie on October 22nd to work a Glasgow – Ayr service due to a death on the tracks disrupting the regular diesel multiple unit services. Likewise 24115 was used extensively between late October and early December. It had been reactivated from Kingmoor, needing only a broken window to be fixed, then spending its time in eastern Scotland visiting most depots between Aberdeen & Millerhill. On October 22nd 24115 worked the 19.52 Glasgow Queen Street - Dundee. Other passenger workings included rescuing 27011 after it failed near Dundee working the 15.10 Aberdeen - Glasgow on November 23rd, the 25th found it in charge of the 1E83 17.10 Edinburgh - Berwick. December 4th saw it working with 26043 on the Edinburgh - Carstairs leg of an SRPS excursion to London. 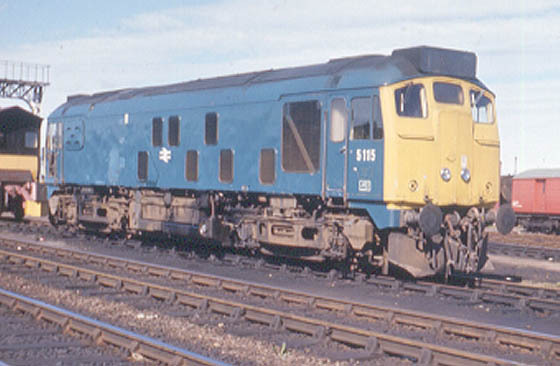 Condition final: blue/yellow livery, gangway doors sheeted over, headlight location sheeted over with circular plates, shortened fuel water tank, full size water tank, boths tanks were fitted with circular gauges, blanking plates fitted (five slats), hand/footholds plated over, cantrail water filler sheeted over, three-rung bogie mounted footsteps, ridge sided sandboxes. The vast majority of the Class 24s withdrawn whilst allocated to the Scottish Region were scrapped at either Glasgow Works or Doncaster Works. 24115 however was one of four Scottish Class 24s to be moved to Swindon Works for scrapping, a lengthy move and one that took it past its birthplace, Derby Works. Page added August 4th 2016.